After last nights early bed everyone including myself felt fully refreshed. Most people spent the morning relaxing at PCSP, playing pool, watching TV etc or headed out for a walk. For Dave R and I the morning was spent finishing off the matlab code that I began to write at the very start of the trip. After lunch, both the Daves, Helen, Berit and myself headed back into town but this time in a van. We posted a couple of postcards before climbing the hill directly behind the Hamlet. From here there were some stunning views of Resolute and the surrounding area. Instead of heading back down we decide to follow the ridge all the way back to PCSP. It was an awesome walk and from the top of the ridge, you could really appreciate the immense size of the place. We were also very lucky to see some sorted circles (google search them) which form only in areas of permafrost. We arrived back at PCSP just in time for dinner and without being eaten by bears!! The evening was again spent chilling out with everyone and playing games of pool and snooker. It was a fitting end to a fantastic trip which I shall not forget for a very long time to come! Today started early than I expected with the first load of gear leaving the ship via the helicopter at around 9am. 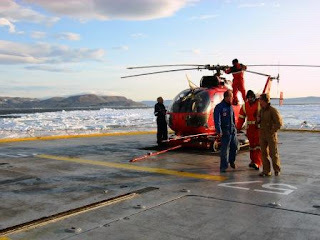 The helicopter had to be used as Resolute Bay does not have a wharf or pier for the boat to tie up to. My turn to get off soon arrived and wow did the ride make up for the slightly sad occasion of leaving the boat. Although it only took around 1 minute to fly from the ship to the shore, the ride was incredible. The views of Resolute Bay and the ship from the air were stunning and I would have loved it to go on for longer. No wonder those that got to fly during the cruise always came back full of it! Resolute Bay is certainly an interesting place. From what I can understand it serves no other purpose than being a Canadian presence in the north as well as a staging post for a fair few Arctic expeditions. The landscape is understandably barren, with nothing but bare rock and mud for miles and miles around. There was not any snow on the ground which is a shame as supposedly it’s meant to make the island look stunning. We have two days in Resolute as we wait to fly out on the 3rd. We are staying at the Polar Continental Shelf Project (PCSP) which is a very comfortable staging post for Arctic Expeditions run by the Canadian government. From leaving the boat to arriving in Resolute (a 1 minute flight as you know) made us lose an hour as the boat time was one hour ahead. This made waiting for lunch particularly hard seeing as we had missed breakfast in the morning. After a quick check with the base manager to make sure there had been no recent bear sightings we set off for a walk from the airport where PCSP is to the hamlet. Distance are deceiving and the walk ended up being 8km. we had a quick look around the town before catching a ride back to PCSP for diner and an early bed. Today was our last day on the boat and geezs it was a busy one. Amongst many other jobs, all the scientific gear had to be packed up, the foredeck cleared off all the buoys, floats and chains left over from the moorings and the water samples from the rosette sections moved from the front to the back of the boat. The ships barge even had to be deployed to move ADCPs from the front to the back of the boat as they were too heavy and too large to be moved by hand. Seeing as Humfey and Ron were going straight from the Larsen onto another icebreaker, the Sir Wilfred Laurier quite a bit of the gear had to be separated from the rest ready to be slung over to Resolute Bay tomorrow. Between all this, I also had to process the data from the final CTD cast and get it plotted up in ODV as well as finish writing with Dave the Matlab code I had started during the first two weeks at the IOS. In the end we got everything finished except the Matlab code which didn’t matter as it gave us something to do to pass the time in Resolute Bay. The final evening with the crew was possibly the best evening of the entire trip. Even after the bar shut, the evening still went on with plenty of merriment and dancing before finally crawling into bed somewhat later than planned!! The problem with weather stations is that in order for them to be of any interest, you have to put them in quite inhospitable spots. This poses certain challenges for the installation team. 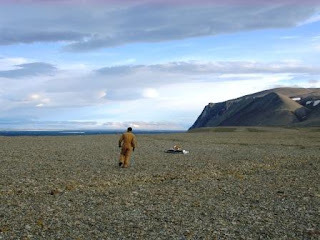 In other words, the best place to put up a weather station would be my garage - with a nice stop for lunch halfway through - but, the best place to have a weather station collecting data would be somewhere like Cape Baird, on northern Ellesmere Island. Nares Strait experiences frequent severe winds (occasionally, in excess of 80knots!) due to air-channeling by the high surrounding terrain. Cape Baird lies fully exposed to these winds on the tip of the Judge Daly Promontory to the west of Hall Basin at 81˚ 33’ N and 64˚ 31’ W. It’s just the nasty sort of place that’s perfect for monitoring the weather. Together with stations on Hans Island (Kennedy Channel, 80˚ 49.4’ north) and Brevoort Island (west side of Smith Sound, 78˚41’N), we hope the Cape Baird installation will allow us to gain insight into the meteorology of the 250 nautical mile strait and improve our ability to forecast weather in the area. Foggy conditions on August 17th prevented helicopter operations and kept us from flying to Cape Baird until early evening when the wind, which had been developing since the mid-afternoon, cleared away the fog. Humfrey, David and I departed for the cape with pilot Bob Bartlett expertly flying us to shore in the gusting winds. I noted at the time that we flew oriented about 30 degrees off-heading to counter the prevailing southerly wind. The downdrafts coming off the top of the 120m-high cape were strong enough to equal the upward lift of the helicopter at full power: under neutral conditions we would have been climbing at 5m/s, as it was, we were not climbing at all- in fact we were slowly losing altitude. Undoubtedly, a lovely evening to install a weather station. We made two survey sweeps of the area to determine the best location. As we passed across the headland, we startled two large groups of Arctic hares, bright white against the brown, rocky ground. Once we had landed and unloaded the gear (Bob kept the chopper under power to maintain stability), we had to collect rocks to hold down any equipment that weighed less than about 25kg. The solar panel, light and shaped basically like a sail, was particularly vulnerable. We later determined that the wind was gusting to up to 25m/s (90 km/hr). I found it interesting that it almost blew my toque off. I’ve never experienced conditions that could plausibly remove a snug-fitting winter cap from your head. Fortunately, the air temperature was a remarkable 6 to 7 degrees Celsius. Had it been closer to the 0-1 degree we had been having on the ship, we may have had to postpone the operation. As it was, the operating conditions were challenging but not impossible. The first step in the installation of a weather station is to secure the tripod/mast structure. We were eager to get this step completed as the sensors would be safest attached to the mast, not pinned in boxes under rocks. The ground was rocky, but loose. David determined that while a stake was difficult to pound into the ground, it could be pulled back out with two fingers. This meant that we had to collect large rocks (30-50cm across) to hold down the tripod feet and guy-wire anchors. Once the tripod was up, we attached the anemometer (wind-speed and direction sensor), the temperature/relative humidity probe, the pyranometer and net radiometer (solar radiation sensors) and the control box. The latter contains a barometric pressure sensor and the simple computer that polls the sensors and stores the data. Finally, we attached the Iridium antenna, the solar panel and the batteries before wiring the sensors, minimizing the exposed wiring, and activating the data-logger. It has been determined that these stations are somewhat attractive to polar bears. At the Pim Island station in Smith Sound, the aluminum bracket holding the temperature/humidity sensor was bent over 90 degrees, and the solar panel bent and scratched – presumably by a bear taking exception to the station. We hope that by pulling any excess wire inside the box and strapping the exposed wires tightly to the mast we can lessen the likelihood that a bear will find some dangling bit of electronics amusing. Final operations before being retrieved by the helicopter were to power-up the data-logger, format the memory card, monitor the sensor data and wait until the hour mark to watch for successful operation of the Iridium transmission. This station is outfitted with a modem that allows the software to transmit data, once an hour, to an Iridium satellite. A service provider receives that transmission and sends the data directly to my inbox at the Institute of Ocean Sciences in Sidney, BC, Canada. This way, we collect the data without having to return to the station to download the data, an operation that is never guaranteed because of the uncertainty of ice conditions. In many years, it is too difficult to get within helicopter range of the station because of heavy multi-year ice in Hall Basin. Content with the mechanical strength of the station and happy to get out of the wind, we returned to the Larsen leaving the weather station to collect and transmit data, we hope, through the next two years. It was steady enough to handle 40 knot winds. Can it survive 80 knots and a bear attack? I am writing the last two days after having slept for only 5 hours after a 24 hour shift. Sorry if they make no sense! So in the end the CTD section turned out to be longer than we expected and we didn’t finally crawl into bed till 8.45am. Pretty much a 24 hour shift! I woke up again at 2.30 pm and spent a somewhat jaded afternoon processing the new CTD data and running a few calibration checks between the three different CTDs that have been used this trip. As a lot of the sections have data from more than one CTD we needed to be sure that they were recording the same values. If one CTD was always over estimating a parameter it would have to be taken into account when the data is finally processed back at the labs. Whilst we were sleeping, the rest of the team deployed a new mooring containing both an ADCP and ice profiling sonar. They then began to pack up and clear everything off the decks back into the two shipping containers that we brought on board as the electronics lab and mooring construction workshop/CTD operation lab. After a few drinks in the bar, most people got an early bed ready for the busy day of packing tomorrow as we depart the ship on the first. Today we cruised north from the mooring line in Norwegian Bay where we spent the day drifting with the ice. The day was dominated by the ice work and very little, if not none, ocean work got done. Justin and Ben made a couple of flights with their bird whilst Michelle, Carl and Richard spent the whole day out on the floes. They deployed their second thermistor chain which they were all quite pleased about. After yesterday’s mishap with the data and ODV, I spent the majority of the day uploading the remaining 25% of the data, whilst making copious backup copies!! Otherwise the rest of the day was spent analysing more of the CTD data and writing a couple of new matlab programs for different things. As today was Thursday it was also the weekly Larsen BBQ your own steak night. Come dinner time, you head out onto the deck were you can pick out of the meat vat and cook, the largest piece of steak you have even seen. Of course it is the Larsen so if you are feeling extra peckish you can also cook yourself a pork chop! BBQing in minus temperatures with sea ice and glaciers streaming past in the background is a very surreal experience. However one definitely not to be missed! After the ice teams returned to the boat, the plan was to loop round the north of Devon Island into Penny Strait to pick up the next mooring 50 miles away. However the ice was far too thick for the boat to even consider breaking through so we had to turn around. What had been a 50 mile cruise promptly turned into a 600 mile 2.5 day cruise back into Jones Sound to Baffin Bay were we headed south and west into Lancaster Sound before turning north again at the south west tip of Devon Island back into the other end Penny Strait. It’s kinda hard to explain so have a look at the ships track on the website I linked to in the ‘Precursor to the Arctic’ Post.